IN 2005, when almost all other crops were in severe crisis, driving farmers to commit suicide in Kerala, rubber growers in the state were counting profits. They were witnessing a price boom after six years of distress. The price of the most preferred and traded variety in India called ribbed, smoked rubber sheet (RSS-4 grade) jumped from Rs 39 a kilogram in 2003 to Rs 66 in 2005. The growers did not expect the price to stay high for long. However, it not only stayed but started galloping, touching Rs 240 in April 2011. It was an unprecedented peak in the history of rubber. “I had never thought I would be able to get such a high price for rubber in my life,” says 44-year-old Robin Augustine, a resident of Kadanad village in the Pala region of Kottayam district. Kottayam and some of the neighbouring areas in southern Kerala, known as Central Travancore, constitute the most fertile rubber belt in the country. Augustine’s family has been growing rubber for three generations. “During the boom, I used to get a profit of Rs 2-3 lakh a year,” says Augustine, who has two hectares (ha) of plantation. Business in the Kottayam market, the biggest rubber trading centre in the country, was thriving. A spending spree was evident in Kottayam. New houses, luxury apartments, big shops, hotels and resorts mushroomed. Costly cars hit the road. Children were sent to expensive boarding schools. Land transactions went up even as land value skyrocketed. Then came the crash. Since 2012 rubber prices started spiralling downwards. On December 18, 2014, the price of natural rubber (RSS-4 grade) in the Kottayam market was Rs 113, a five-year low (see ‘Rise and fall of rubber rate’ on p34). The global price of rubber (RSS-3 grade) at the Bangkok market stood at even lower, Rs 95. Today, a cloud of uncertainty envelops Kottayam and other rubber-growing areas. A number of dealers have shut shop. Many small units making rubber-based products have closed down. “The cost of producing one kilogram of dry rubber comes to Rs 150-160. It is not profitable to produce rubber when price goes below this level,” says Binny Mathew, president of a rubber producers’ society in Kadanad, which has 300 small growers as its members. Small growers and farm labourers, who constitute a large segment of the state’s plantation workforce, are the hardest hit by the downturn. Just like Augustine there are over one million rubber growers in Kerala, the country’s rubber capital. Barring about 320 large growers with more than 10 ha of plantations, all others are small cultivators with a landholding less than 0.55 ha, as per official data. These plantations employ about half a million skilled labourers for tapping the milky fluid, called latex, and processing it into rubber sheets. During the boom, the cost of everything from inputs to labourers went up, says Mathew. Tappers, who extract latex, were paid Rs 26 for tapping 100 trees in 1999. Now they charge Rs 150-200 in Kottayam. 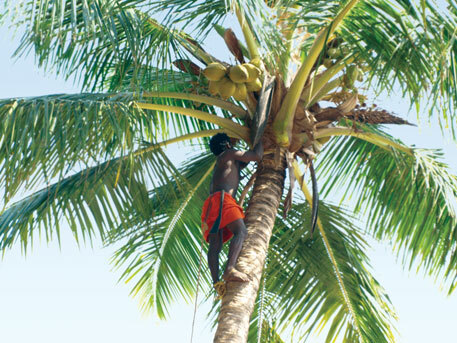 To tap a tree in monsoon, rain guards are fixed on its bark to prevent water drops from falling into the coconut shell in which latex collects. This costs about Rs 50 a tree. “I sent away all the four tappers I had for 25 years when rubber price fell below Rs 150 in January last year,” says Kurien Verghese, a rubber producer with 6.8 ha in Thodupuzha in the high ranges of Idukki district. In many places rubber trees are left untapped. Nor is there any enthusiasm for replanting aged plantations whose productivity has declined. Verghese says he was wise enough to invest in other businesses but a majority of rubber growers in his village are marginal farmers, who, he says, are in deep distress. While small growers are in panic, big producers watch the price trend in anxiety. “Rubber tree is a perennial crop with a reproductive period of 30 years,” points out Mathew Mathew K, physician and planter at Kanjirappuzha in Palakkad district. “Investing in rubber is just like investing in a 30-year business. If it is an annual crop you can switch over to something else. But in the case of rubber it is not possible,” he says. 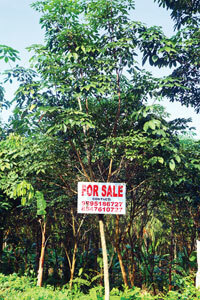 Small wonder, “For Sale” boards have appeared in front of some rubber farms in the land-starved state. The immediate cause of this downturn was global economic recession. The transport sector alone accounts for about 70 per cent of the total rubber consumption in the world. With economic slowdown there is a corresponding decline in vehicles’ sales and, consequently, in demand for rubber. “Along with this there was a fall in crude oil prices, weakening of the currencies of rubber-exporting Asian countries and speculation that Thailand would release half of the 220,000 tonnes of rubber it had procured at the start of the downswing,” points out Jom Jacob, deputy director (statistics and planning), Rubber Board, the only Central government agency entrusted with the responsibility of developing natural rubber. Thailand did release its stock, leading to excess supply in the market when consumption was low. This further depressed global prices. Another major factor was China, a big rubber consumer, which was decreasing its imports. Between 2003 and 2011, China was focused on infrastructure development—a period that coincides with the boom in rubber prices. However, since 2011 China has reduced its imports of natural rubber and started investing on a large scale in natural rubber production to become self-sufficient. Of the total consumption of natural rubber in the country, tyre industry accounts for 65 per cent. Of this, about a half is consumed by a few big companies such as MRF, Apollo, CEAT, JK Tyres and Balkrishna, which are located outside Kerala. The volume of imports registered a four-fold increase from 77,762 tonnes in 2008-09 to 360,273 tonnes in 2013-14. 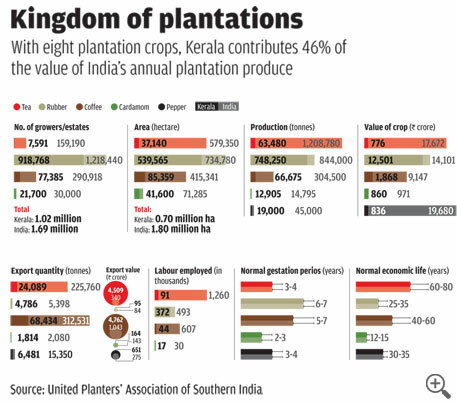 As C Vinayaraghavan, vice-president of the Association of Planters in Kerala, points out, imports are way beyond the shortfall in production. Where is the justification to import 0.22 million tonnes in 2012 when production was 0.91 million tonnes and consumption was 0.97 million tonnes, he asks. Considering the increasing volume of imports, the import duty should be raised to at least 40 per cent, demand producers’ associations. Makers of rubber-based products give their own reasons for import. Rajiv Budhraja, secretary general of Automotive Tyre Manufacturers Association, New Delhi, says the supply is seasonal and depends on climate; small growers engage in poor processing practices and supply from them is inconsistent. Besides, according to him, the quality of sheet and block rubber produced in India does not match the requirement of the tyre sector, particularly for high-tech radial truck and bus tyres. They also complain about lower import duties for finished rubber goods than that for natural rubber. For example, the import duty for finished tyres is 10 per cent, which is half of that for natural rubber. Import duty for other products is even lower. The Kerala government responded to the crashing prices by offering to buy rubber at a slightly higher than market price and forgoing the purchase tax if the industry buys rubber at a minimum price of Rs 130 a kg. But both measures failed. Chief Minister Oommen Chandy and Minister of Finance K M Mani, are particularly worried because both hail from Kottayam and have large sections of rubber growers as their vote bank. They are leading jumbo teams of ministers to Delhi to ask the prime minister for urgent actions. The crisis in the rubber sector is symptomatic of a bigger malaise afflicting Kerala’s farm economy. Today, Kerala is the only state in India, and probably the only region in the world, which is so much dependent on cash crops that are vulnerable to the vagaries of the market, points out Tharian George, joint director of the Rubber Research Institute of India based in Kottayam. The state Agriculture Department’s data shows that eight perennial cash crops—rubber, cardamom, tea, coffee, pepper, coconut, areca nut and cashew nut—account for 65 per cent of the state’s cultivated area, while food crops, such as paddy, tapioca and minor millets, are confined to just 12 per cent. At any time, the price of any one or more of these cash crops could tumble, pushing growers into deep social and financial crises. Growing cash crops is not new for Kerala, but it was never so dependent on them. The state has historically been tied to trade and export. The region’s unique coastal geography shaped this aspect of its economy, while its topography and climate encouraged a diverse mix of crops. The spice trade from the west coast can be traced back to as early as the 3rd millennium BC. By the late 1930s, the state was exporting coffee, rubber, tea, coir and coconut along with spices. At that time paddy dominated the state’s cultivated area. The present shift in the cropping pattern towards cash crops became evident only in the past four decades. A major reason behind this shift was Central government policies introduced in the 1970s to promote cash crops. Rubber, being a commodity with strategic importance in defence, transport and health sectors enjoyed policy protection. Tea, cardamom and coffee were promoted as foreign exchange earners. Rubber Board, Tea Board, Coffee Board and Spices Board, which are under the Union Ministry of Commerce and Industry, undertook promotional activities to expand area under the crops. Kerala was told that the Centre would look after its food needs if the state grew cash crops. Policies were introduced to protect the crops from competition in the international market. Take the rubber sector, for example. After 1970, the responsibility of imports was entrusted to the State Trading Corporation, a Central government agency. Rubber was imported in tandem with the domestic supply-and-demand gap and import duty was set as high as 75 per cent. The sector was protected from price fluctuations through measures such as fixing maximum and minimum prices, notifying buffer stock and procuring rubber at remunerative prices whenever prices fell. Rubber Board offered an incentive of Rs 19,500 per ha to growers. Homesteads with multi-crops and different types of trees changed into rubber plantations. Around the 1970s, the state started implementing the Kerala Land Reforms Act of 1967. The Act put a ceiling of 6 ha on the land a person can own, but exempted plantations. This prompted many to convert their land to plantations. Many paddy farmers started growing coconut on their fields, which were later converted into rubber plantations. State agriculture data shows since the 1970s, farmers’ withdrawal from rice cultivation has increased. In the last four decades, area under paddy has reduced by 76 per cent—from 875,000 ha in 1970 to 208,000 ha in 2012. The crisis worsened with the introduction of the liberalisation policies in the 1990s. The initial few years after India’s entry into the World Trade Organization (WTO) in 1995 as a signatory to the World Trade Agreement, saw a phenomenal increase in export prices of many plantation crops. Leaders of the Kerala Congress, including the state’s present Finance Minister K M Mani, praised the Centre’s neoliberal polices. But the heat of the global competition was felt within a few years—rubber price started sliding for the first time in 1997 following large-scale import of cheap natural rubber. Other cash crops in which Kerala has a substantial stake, namely, tea, coffee, rubber and cardamom, also had to compete with low-cost imports. Prompted by the falling profits from the traditional commodities, farmers increasingly turned to cultivation of exotic varieties, which have markets outside India. Vanilla, one of the costliest spices in the international market became the new favourite of Kerala farmers. In 2003, fresh vanilla beans fetched a mind-boggling Rs 4,000 per kg due to a slump in the global supply. A cyclone had destroyed vanilla farms in Madagascar, the world’s top exporter of the spice. That year, police stations in many parts of the state received unusual complaints of vanilla beans and even the entire plants being stolen. Many vanilla farmers pressed private security agents into service in their farms. As expected, the boom ended in three to four years when Madagascar recouped. The prices of vanilla beans in Kerala crashed to Rs 80. By that time, rubber had recovered from the price slump and its price had started galloping. In 2005, rubber started spreading everywhere, even into the high ranges of Wayanad in the Western Ghats and low-lying areas of Alappuzha, a coastal district, where agro-climatic conditions are not suited for the tree. People cleared coconut plantations and paddy farms to grow rubber. Excellent extension services by the Rubber Board helped. Coconut, a major cash crop in the state, and tapioca, a tuber widely eaten in Kerala, lost much of their area to rubber. In 2010 alone coconut lost about 8,000 ha to rubber, the state agriculture department’s data shows. By 2011, rubber accounted for 45 per cent of Kerala’s agricultural GDP. The good time continued till 2012-13, when the prices of commodities crashed again. Just like rubber growers, cardamom farmers in Idukki are in severe distress. Price of cardamom that had jumped to Rs 1,600 a kg in 2010 crashed to Rs 450 within two years. By January 14 this year, the price had risen to a measly Rs 680 a kg. “Traders are importing low quality cardamom from Guatemala, mixing them with the high quality local variety, and selling in the domestic and global markets under the brand of Indian cardamom,” says K S Mathew, president, Cardamom Growers Association, Idukki. This brought bad name to Kerala cardamom, which has lost its traditional markets, including Saudi Arabia, the largest importer of the spice, he adds. Coffee growers in Wayanad, a major coffee cultivating area in the state, are in deep distress over the declining price of the premium Robusta coffee and erratic rainfall during the harvesting season. The spot price of raw coffee in the district on January 3 was Rs 3,750 for a bag of 54 kg as against Rs 4,400 a month ago—a drop of nearly 15 per cent in a month. The price of coffee beans declined from Rs 145 a kg to Rs 128 during the period. This will seriously affect the coffee growers, about 70 per cent of whom are small cultivators with a landholding less than five hectares. Small tea growers in Wayanad are also a worried lot. The spot price of green leaves on January 3 was Rs 8 a kg against Rs 13 in the corresponding period last year. As per Wayanad Small-Scale Tea Growers Association, 12,000 small growers depend on tea for their livelihood in this district. As there is no public sector tea processing factory, tea growers are forced to sell their produce to agents from Tamil Nadu for much lower prices. Coconut is still not doing well despite 30 agencies working to promote coconut culture and helping farmers earn more from it. Even when all these agencies were working towards coconut development, coconut lost much of its area to rubber. The price remained very low at Rs 10 a kg for many years. Recently, it rose to Rs 30 a kg due to a reduction in production. As for the cashew sector, it has already started showing signs of an impending crisis. Last year India exported cashew nuts worth Rs 5,000 crore. This year, in the first quarter, production has reduced by 20 per cent and price has fallen by six per cent. Growers in Kerala are now looking up to another crop: oil palm. Many paddy fields that have remained uncultivated for several years and coconut farms are being converted into oil palm farms in pockets of central Kerala. Promotional programmes initiated by Oil Palm Development Programme, sponsored by the Central and state governments, are acting as a catalyst to the new revolution on the farm front. Farmers are once again hopeful. “If the rubber price remains low for long, we will cut the trees and plant oil palm,” says Kurien Verghese. Since most growers in Kerala have small landholdings, Verghese says growing oil palm individually will not be profitable. He plans to join other farmers to grow the crop as a group. Kerala’s plantations account for about 40 per cent of the area under plantation crops in the country (see ‘Kingdom of plantations’. Every year, they produce commodities worth about Rs 18,000 crore, says Vijayan Rajes of UPASI. This is 46 per cent of the value of the country’s total annual plantation produce. According to Kerala Economic Review 2013, the average annual return per hectare of farmland in Kerala is Rs 97,200—this is three times the national average. 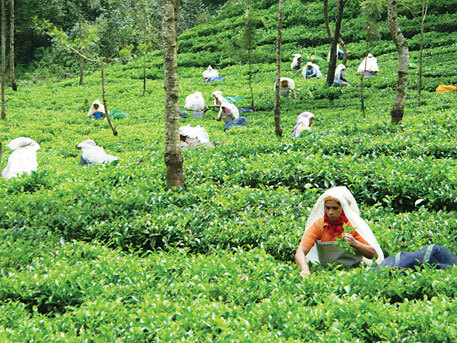 Return from plantations of tea, coffee, rubber and cardamom is Rs 2.3 lakh per hectare. At least 1.2 million people—half of them women—depend on these plantations for a living. As R Hailey, former director of the state agriculture department, puts it, “Plantations are the engine of the farm economy in the state.” Any fluctuation in the production or price of these crops will have a big impact on the farm economy of the state as well as the country’s supply of commodities. For instance, this small state shoulders the burden of supplying natural rubber to the nation. It accounts for 83 per cent of the country’s natural rubber production and 74 per cent of the area under rubber, according to the Rubber Board. Thanks to Kerala, India also achieved the number one status for productivity during 2006-2012, although its agro-climatic conditions are not best suited for rubber. India, with 77,400 tonnes of natural rubber production in 2013-14, was the fifth largest natural rubber producer. Unlike other major producers that grow rubber for export, India consumes a large portion of what it produces with a minimum of exports, and has become the second biggest consumer of natural rubber after China. Only 34 per cent of the rubber consumed in India is synthetic, produced from crude oil through a highly polluting process. “Rubber is not just a cash crop, it is a strategically important commodity used in crucial sectors, including defence, transport, communication, energy, health and birth control,” points out James Jacob, director of the Rubber Research Institute of India in Kottayam. Over 50,000 products are made from rubber. According to Jacob, a direct correlation exists between economic growth and consumption of rubber in fast-growing countries such as India and China, unlike the highly developed countries where the two have stabilised. “The faster the GDP growth, the more the rubber consumption,” says Jacob. Both price booms and price crashes of these cash crops are affecting good agriculture practices, Jacob points out. Most plantations in the state are now aged. Yet, replanting is taking place only in a small way. During the price boom, growers are reluctant to remove their plants, and during the price crash, they lose the enthusiasm to replant the old plantations. In Idukki’s cardamom plantations banned pesticides such as endosulphan are used. Excessive use of pesticides, fungicides, weedicides and fertilisers has severely contaminated soil and water bodies, turning the high ranges into a toxic hot spot. Besides, decades of mono-cropping has reduced soil fertility and hence the yield. The productivity for rubber has declined from 1,931 kg per ha in 2011-12 to 1,907 kg per ha in 2012-13. Long-gestation mono-crops have also affected the region’s rich biodiversity. “Planters often say they have created a green paradise in 70 per cent of the Western Ghats in Kerala,” says M K Prasad, ecologist expert on the Western Ghats. This means that natural forests have been cleared in 70 per cent of the Western Ghats for growing rubber, cardamom, tea and coffee. This has led to large-scale biodiversity loss. The loss is the highest in rubber plantations, which do not allow any other plants to grow under them, says R K Dhiman, vice-chancellor of Dr Y S Parmar University of Horticulture and Forestry in Solan, Himachal Pradesh. Many important shrubs and herbs have disappeared from rubber plantation areas, says Dhiman. He suggests that rubber plantations should not be promoted in a biodiversity hotspot like Kerala. It should be allowed only on degraded land. Anil Kumar, director, Community Agro-Biodiversity Centre (CABC), Kerala, cautions against latex-yielding plants like rubber. These plants have less number of stomata, responsible for transpiration, which leads to dry climate. Rubber plantation is also a breeding ground for mosquitoes, he says. CABC is working with farmers and trying to evolve a system where crop diversification get its due attention to conserve natural resources. Jacob suggests that plantation crops should be integrated with local food crops, tree species and natural flora for better conservation of biodiversity. Maybe, Kerala should go back to its age-old practice of mixed farming, which proved beneficial for its surrounding ecology. The government should introduce a policy for sustainable promotion of plantations, he says. Officials in Kerala say they cannot do much to improve the situation because rubber, tea, coffee and cardamom, being trade-oriented and earners of foreign exchange, are managed by commodity boards, and do not come under the state’s agriculture department. “The state cannot make major policies regarding these four crops,” says R Ajithkumar, director of the state’s agriculture department. The planters are bitter about the fact that even though they contribute about Rs 20,000 crore a year to the state exchequer through plantation tax, building tax, sales tax, value added tax, property tax and professional tax, the state government is indifferent towards them. “Those owning big plantations, with an area more than 20 hectares, have to pay 50 per cent agriculture tax, which is one of the highest in the country. Yet the government does not do anything to protect our interests,” says Vinayaraghavan ruefully. Any crisis in Kerala’s plantation sector affects the prospects of millions of growers, workers, manufacturers, consumers and the economy of the state and the country. Hence a complete revamping, restructuring and empowerment of the state’s farm sector is needed to enable its plantations to produce at a competitive cost and in an economically viable and environmentally sustainable manner. Experts say crying hoarse at the time of a price crash and rejoicing during booms will do no good. It’s time the government introduced comprehensive policies and time-bound programmes for short-term, mid-term and long-term actions to help growers tide over uncertainties of the market. Price stabilisation measures like fixing maximum and minimum prices, creating buffer stocks, fiscal and export incentives and procurement will not be as effective as they were in the pre-trade liberalisation period, when the domestic market was protected from global competitions, point out Tharian George. “This was evident in 1997 during the first price crash of rubber following the economic reforms. The Centre had tried these measures to stabilise falling rubber prices. It had restricted rubber imports. But none of the measures served its purpose,” says George. The government once again tried these measures during the recent price slump in the rubber sector , but they failed. Now, for the first time, the Centre plans to address the crisis that ails rubber. The Union commerce ministry appointed an expert committee in June 2014 to review the sector and draft a national policy. The committee, headed by Rajani Ranjan Rashmi, additional secretary (plantations), is holding talks with different stakeholders. While it is true that major policies regarding rubber, cardamom, tea and coffee should be made in Delhi since they are governed by commodity boards under the commerce ministry, it’s time the state stepped in to empower its farm sector, instead of just leading delegates to Delhi. “It has been 40 years since Kerala shifted to cash crops,” says K J Joseph, professor at the Centre for Development Studies, Thiruvananthapuram. “But the government never focussed on diversifying produce, let alone enhancing productivity or formulating mechanisms to sustain its production bases and tide over market fluctuations,” Joseph alleges. Since the market for Kerala’s produce is outside the state, the government needs to provide direct market linkage to growers and make produces competitive through processing and value addition, he suggests. It should also introduce better management for each crop, says Thomas Isac, economist and former finance minister of the state. For this, Isac says, commodity boards have to take the state agriculture department into confidence while drafting policies and implementing programmes. As Jacob points out, growers should be encouraged to increase yield, adopt multi-cropping and intercropping, and follow environment-friendly and sustainable practices, with added objectives of conserving soil, water and biodiversity. Maybe it can learn from Tripura whose climate is similar to that of Kerala. “Shifting agriculture had degraded Tripura’s land. We rejuvenated the land by following an agroforestry model, in which shade-loving crops like ginger, black pepper, lemon and orange are grown underneath trees,” says Dhiman. Given the price volatility of commodities, diversification through value-added products in the commodity chain or moving out of the commodity business is the only way out, says K N Harilal, professor at the Centre for Development Studies. To achieve this, the commodity boards can encourage small growers to form societies and help them install processing facilities. 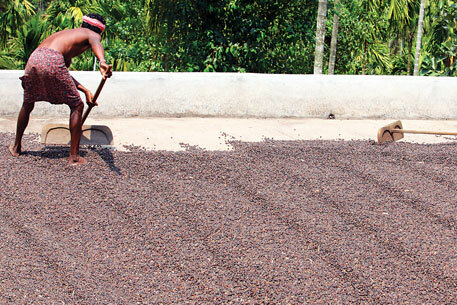 Under Rubber Boards’ initiative, 2,500 producers’ societies have been formed in Kerala. Two hundred of them have received financial help from the Board to install processing facilities and are producing high quality rubber sheets. Another way to support producers is to introduce a price insurance scheme, says C K George, Kochi-based international trade consultant who was with the Spices Board. The Centre and state should make it comprehensive by taking into account the commodity, cost of production, market price of the produce and the grower’s cost of living, he suggests. Despite having a farm sector that is at the mercy of global trade forces, Kerala does not have a mechanism to inform cash crop growers about international market developments and caution them against possible fluctuations. The state’s WTO cell formed to advise the government on the impact of international trade agreements is not functioning for want of staff and other facilities. In such a scenario, growers blindly run after profits and face disasters. “The state should relook at its land reform and focus on adding value to plantation crops,” says G Vijayaraghavan, member, Kerala State Planning Board. One thing is sure that the state would never reap the kind of returns it used to get from its rubber, tea, coffee or cardamom plantations, considering the rising cost of production and decreasing productivity. So the government must carry out an in-depth study on the present scenario and take required steps to empower its farm sector, he suggests. Besides, acute shortage of labourers plagues large plantations, which require regular upkeep. Long-gestation plantations require a large number of workers for harvesting, spraying pesticides, weedicides and fertilisers and for other farm activities. Though Kerala plantations offer Rs 300 a day, the highest in the country, young generation of labourers is migrating to other sectors for more wages. For instance, they receive up to Rs 650 a day for working in agricultural farms, while the construction sector offers Rs 700-800 a day. Besides, the educated young generation of plantation workers are opting for other occupations. Unlike in other states, large plantations in Kerala have to abide by the recommendations of Plantation Labour Committee (PLC), a tripartite committee with representatives from government, plantation industries and trade unions, to ensure welfare of farm workers. “But many plantations stop these welfare programmes, especially during price crash,” points of M P Joseph, adviser to the Kerala government holding the rank of additional chief secretary. He had chaired the PLC earlier. Experts say overdependence on a large number of workers will not be good for the failure of plantations. In the wake of the acute labour shortage, planters must adopt advanced farm technologies to reduce their dependence on workers. “Simultaneously, planters should develop an efficient labour force by upgrading their skills and education and by providing them better facilities to make the sector more attractive,” says Vijayaraghavan. Sulochana Nalapatt, who was a doctor in a Tata Tea plantation in Munnar for two decades, says care and welfare measures for workers have come down over the years. If the plantations wish to have a good future, they must develop a healthy labour force by taking good welfare measures and providing healthcare services for workers. Continuous use of chemicals to increase the production not only affects the health of soil but also the health of workers. To top it all, the changing climate has not been beneficial to the plantations. According to Jacob, a rise of 1 degree Celsius reduces rubber yield by 10 per cent. Prolonged dry spells and excessive and untimely rains too adversely affect production. 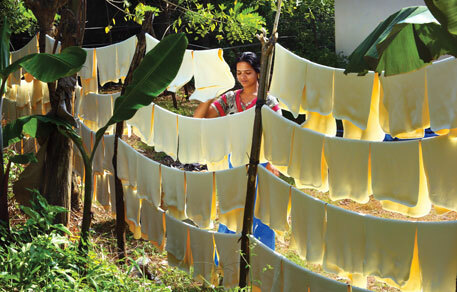 Kerala’s rubber production had drastically reduced in 2012 due to incessant rains. “There was excessive loss of leaf area in rubber holdings because of unusually prolonged monsoon led to an outbreak of Abnormal Leaf Fall Disease in 2013,” he says. Strategies should be developed for adapting to changing climate. This is a must because trade liberalisation is the order of the day, and market uncertainties are here to stay. The date of the report is Feb 15 2015? This is well researched piece ... As planting Family i need to give more insights into the Value additions of the land with sustainable initiatives ...other wise it almost and end of the road to stay well afloat . Thank you for sharing very informative article with us. The topic on "Plantation crops-prospects and issues" with reference to Kerala State is well versed in the article.